With over 600 advertisers at BeRuby you can easily find stores to meet your needs. Here is some valuable information related to purchases on BeRuby. First and foremost, to be eligible to earn any money for your purchase, you MUST use the links on the BeRuby page. When you click on these links and purchase (register/click) something, the advertiser recognizes that you are from BeRuby and pays us a commission, which Beruby shares with you. This is very important because if you use any other link the advertiser will not pay Beruby. It is easy to use Beruby links to get to your favorite stores. 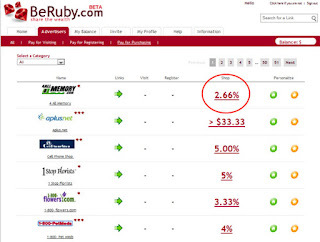 Simply search for them in BeRuby, check out the Directory, or click the Advertisers tab. How do I know how much money I will earn when I buy something through BeRuby? Notice the circled area. This number tells you the amount of the purchase you can earn back. It is important to click on this number, as it will explain any terms and conditions. Another item to mention is that in the circle you see the word “shop” this means that you will receive this commission when you make a purchase. Other commissions may fall under the “Visit” or “Register” category. What should I expect once I’ve completed a purchase (registration or click)? Once you have completed an action (purchase, registration or click) it will take 2 days to show up on your account under the estimated list. It will remain estimated until the advertiser pays Beruby. This time depends on the advertiser. You can check your balance at any time by clicking on the “My Balance” tab in your BeRuby account. After 2 days if a transaction has not appeared in your account, you can make a claim.